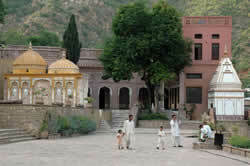 ISLAMABAD: A trip to Saidpur Village is like heading back into history – a narrow winding road leading up to the landmark Hindu temple at its entrance, stacks of hay, terraced mud houses and the Margalla Hills overlooking them all combine to turn the clock back. Having been cuddled up in the comfy lap of the Margallas for centuries, the village provides a vivid account of what it actually used to be in yesteryears, long before Islamabad came into being through a photo museum set up inside the renovated temple. The Capital Development Authority (CDA) recently made cosmetic changes to the village’s face making it more presentable and as a result prompting a stream of visitors and tourists. There has been a tremendous interest ever since the authorities declared the project open to public last April with television crews capturing the beauty of the village and beaming it to a wide audience. Ibrar Hussain, the CDA’s administrative officer at the photo museum, told Daily Times that the electronic media routinely visited the village. “This goes to show that this place is proving to be a hit,” he said. Project Director Shabbir Malik pointed out that it were places like these that drew in the tourists and not structures of concrete. “We have developed a spot that is bound to attract more and more tourists in the days ahead,” he claimed. While the entire village might be of great interest to visitors, for many the museum draws particular attention as it takes one on a journey into years of the past – the time when the first of Islamabad’s bricks were being laid and the Margalla Hills were the town’s only significant feature. Pictures, mostly black and white, of Islamabad in its infancy adorn the four walls of the dimly lit museum and all of its exciting firsts. From the town’s first baby Mahpara who born at the Polyclinic to the first market and from the first double-decker bus to the maiden tree planted at the Shakarparian Hills by Chinese Prime Minister Chou En-Lai, every thing has been preserved in photos at the museum. Also on display is memorable photo of the town planner Doxiadis explaining the master plan to officials of the CDA while another one shows President Ayub Khan reviewing that plan. In other photographs, Indian Prime Minister Jawhal Laal Nehru is seen being briefed on the master plan as is the Shah of Iran and the Crown Princess of Netherlands. Another interesting photo depicts under-construction condition of the buildings of the National Assembly and the Pak Secretariat. Drawing comparisons reveals how the town came up to what it has become now. There are several before-and-now pictures of the village itself, with many of them showing changing face of the narrow Saidpur Road over the years. The temple that has stood there for centuries, however, remains the most prominent landmark.